As a lot of you know, I was the happy winner of December’s Iron Cupcake: Earth challenge, Chocolate With A Twist. I kept promising that I would post photos of my prizes once I got everything, and as of today, I have finally received my last prize (two months later!). #1, Original artwork from Jessie Oleson of cakespy.com. 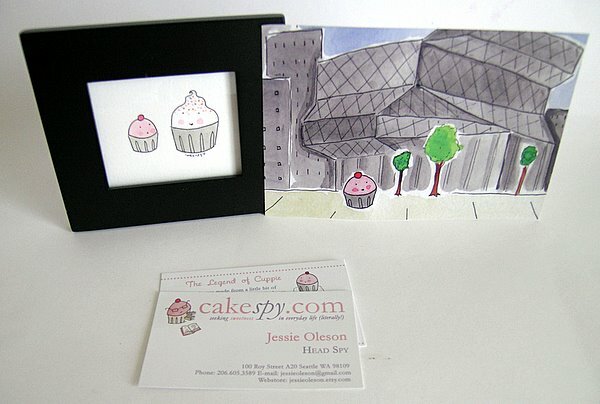 You can buy your own Cuppie art at Jessie’s Etsy shop. 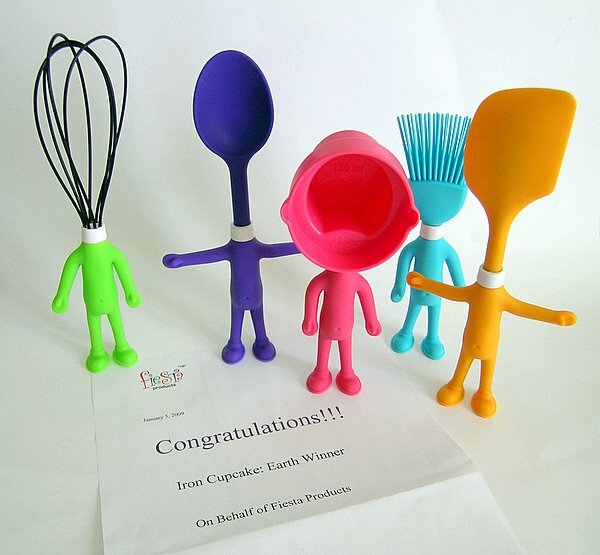 #2, A set of Head Chefs kitchen utensils from Fiesta Products. These are cute little things; they each have little belly buttons and cute little butts. 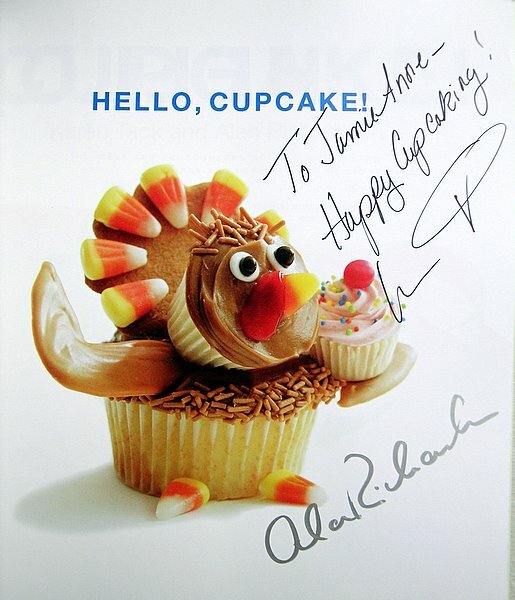 #3, An autographed copy of Hello, Cupcake. Coincidentally, I had gotten a regular copy of this book for Christmas, but gave that copy to my mom as she was very interested in checking out the book. I kept the autographed copy for myself! 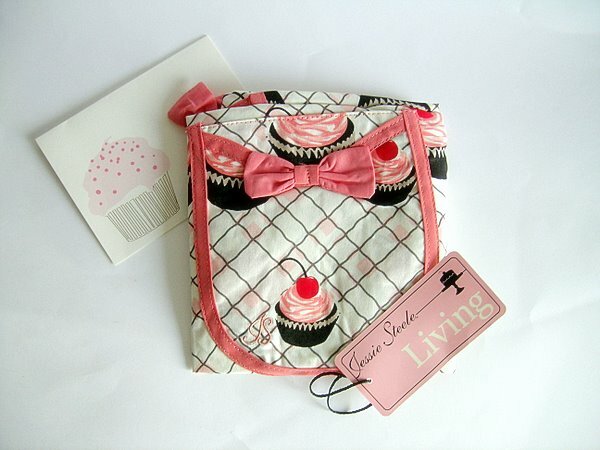 #4, A Jessie Steele cupcake apron. This apron is super cute, but half the time I forget to put it on when I start baking! #5, Cupcake stationery from Betty Turbo’s Etsy shop. 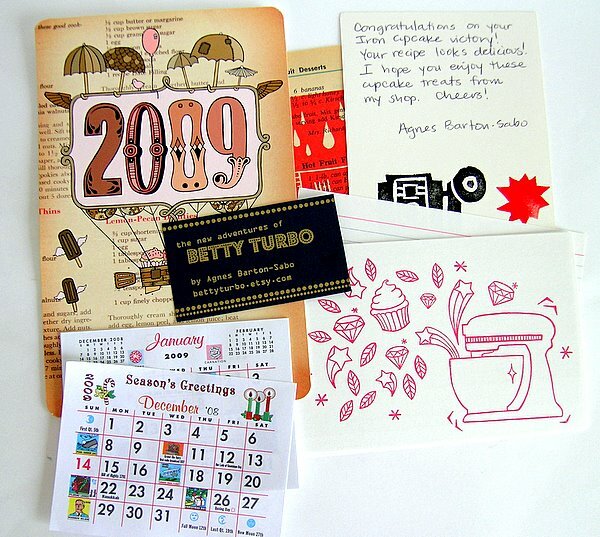 Included was a page from a vintage recipe book with a cupcake image printed on it, recipe cards with a stand mixer printed on the back of each one, and an awesome calendar that is hanging on one of my kitchen cabinets. #6, The Cupcake Courier. This thing is monstrous, and oh so handy! It’s a great thing to own, especially if you need to take your cupcakes somewhere. 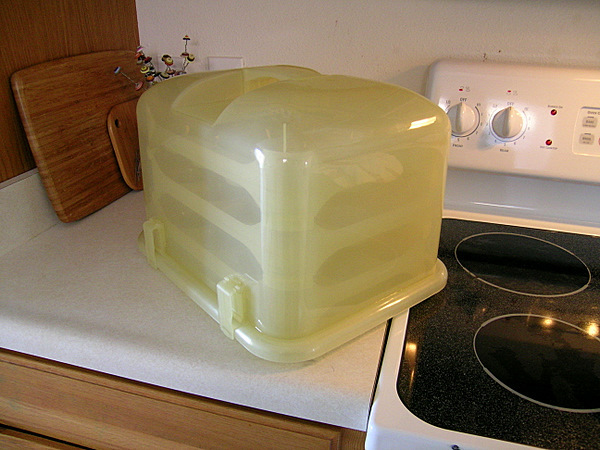 It sure beats the old way I was storing cupcakes – in a 13×9-inch cake pan with a sheet of aluminum wrapped around the top of it! The company accidentally sent me two of these babies; I emailed them asking if they’d like me to return it, but the reply I got stated that I should instead give it to a friend and make her day! 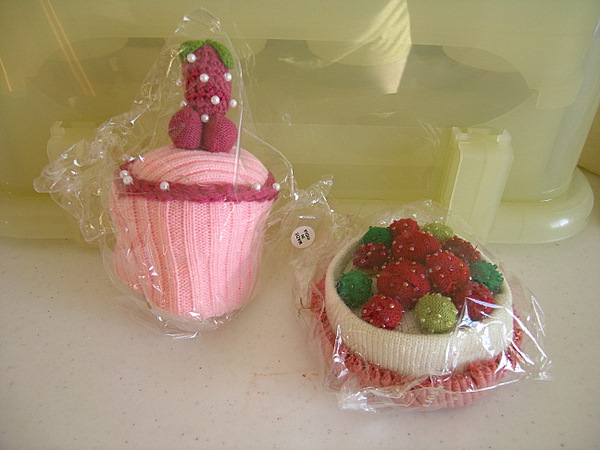 #7, A set of cupcake pincushions from Sweet Cuppin Cakes Bakery & Cupcakery Supplies. Now, I don’t sew, so I gave these to a friend who does do a lot of sewing. She and her daughter were very happy to receive them. 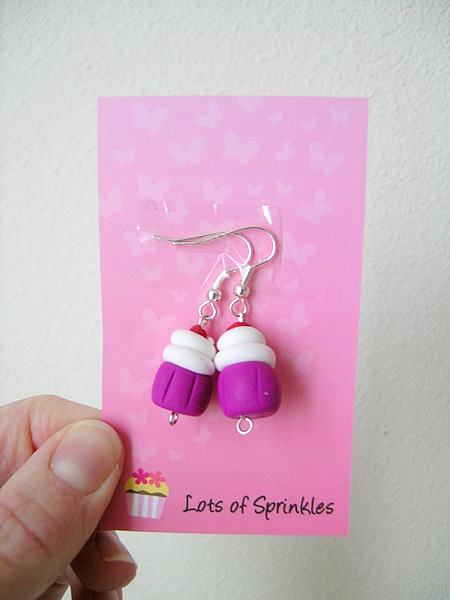 #8, A cute pair of cupcake earrings from Lots of Sprinkles’ Etsy shop. Unfortunately, I don’t have pierced ears. #9, The very last prize that I received today is the prize I’ve most been looking forward to. 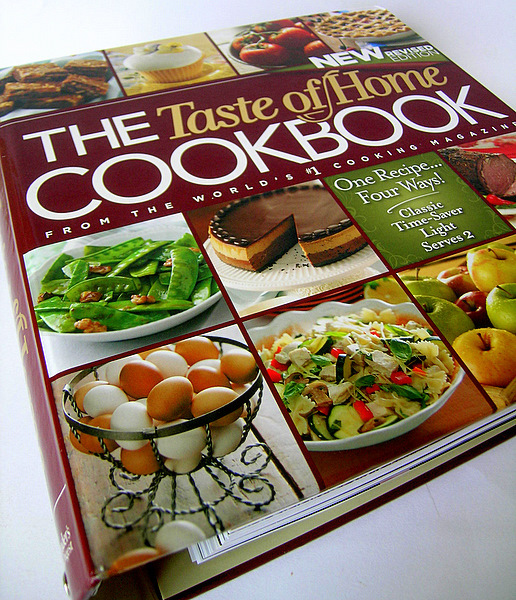 The Taste of Home Cookbook, with over 1300 recipes. This book is a monster and looks like it’s packed full of amazing recipes. You can expect to see some here soon! Wow! Talk about loot! Congrats on the win – you deserved it. 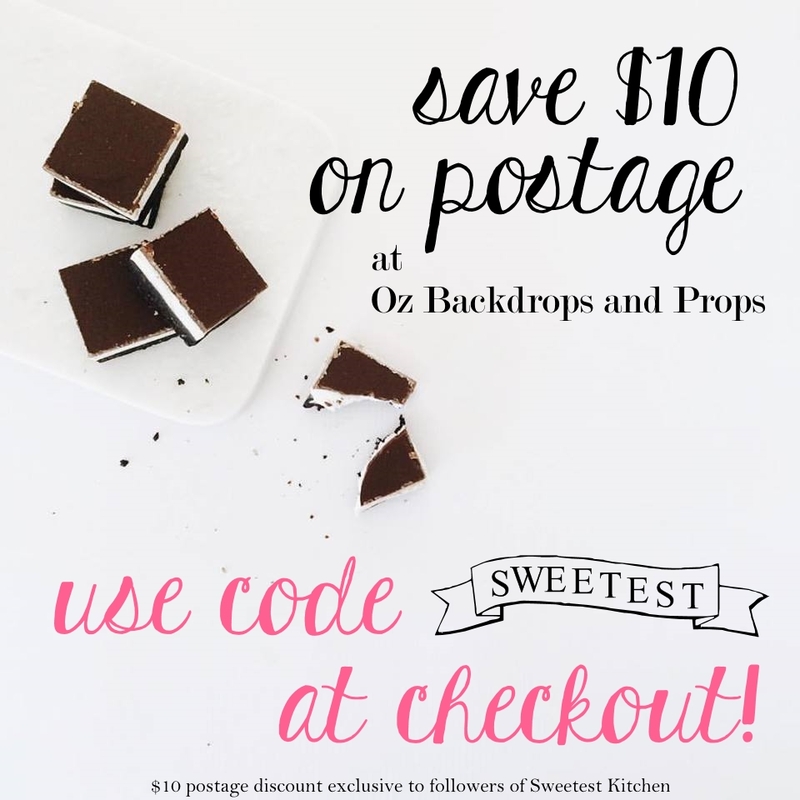 These are awesome prizes – love them all! Enjoy! wow! now i only have to get up enough guts to enter. love the new lay out and look forward to reading much more from you. Yeah! Glad all your goodies showed up! Congrats again! Little Miss Cupcake, thank you! Jackson, don’t worry about it, just enter! Anyone can win and everyone loves seeing all the new cupcake creations every month.